John Carroll School in Bel Air, Maryland recently did a food drive to raise money, at least that’s what student Mike Tertsea thought it was until he found out what his classmates were really using the money for. Mike was originally born in Nigeria, his mom sent him away at 14 years old to go to the John Carroll School with the hope to be able to give him a new life. 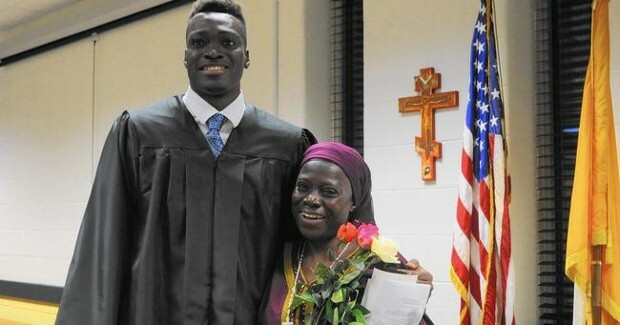 The 6’10” Nigerian quickly became the star of the basketball team and was succeeding in school, unfortunately ,this also means he hasn’t been home to see his mom in four years. After the students heard about Mike and his mom they decided to do something a little crazy and a lot of awesome. They threw the food drive not to buy food, but a plane ticket for Mike’s mom to visit and be there for graduation. The students even got all the travel documents including a visa taken care of. In the end, they were able to raise $1,600 which was awesome but still short of the full cost of the ticket. A teacher was following the story and heard they were short and he helped come up with the last $500 they needed to be able to make the trip. The whole time, Mike was clueless. It took Mike’s mom, Felicia, over 12 hours just to get to the airport from her village then another 11-hour-flight to America. They mother-son duo met at the airport and the reunion was even sweeter than expected. The mother, who hadn’t seen her son in four years couldn’t believe how much he’d changed. He’s “big, bigger, too big … I didn’t recognize him he was so big and he put on weight,” she said.